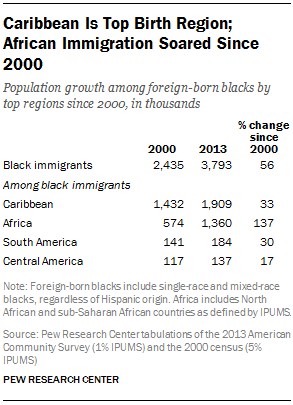 Rapid growth in the black immigrant population is expected to continue. The Census Bureau projects that by 2060, 16.5% of U.S. blacks will be immigrants.1 In certain metropolitan areas, foreign-born blacks make up a significant share of the overall black population. For example, among the metropolitan areas with the largest black populations, roughly a third of blacks (34%) living in the Miami metro area are immigrants. In the New York metro area, that share is 28%. And in the Washington, D.C., area, it is 15%. Many black immigrants are from Spanish-speaking countries. Among these, the Dominican Republic is the largest country of birth, accounting for 161,000 black immigrants. 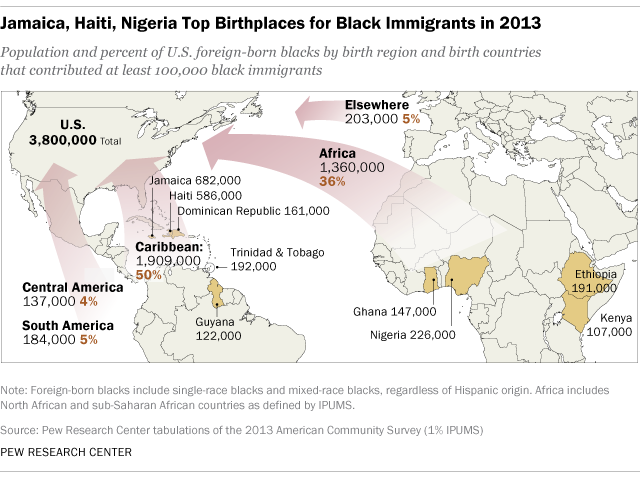 Mexico is also a source of black immigration with roughly 70,000 black immigrants. Some 41,000 are from Cuba, and 32,000 are Panamanian. Moreover, 11% of the foreign-born black population identifies as Hispanic. The United States has long had a significant black population.4 In the nation’s earliest censuses (at the end of the 18th century), blacks accounted for nearly one-fifth of the U.S. population, with nearly all brought to the U.S. as slaves from Africa. Today, most of the nation’s 40 million U.S.-born blacks trace their roots to this population. When compared with U.S.-born blacks, foreign-born blacks are older, with a median age of 42 years versus 29 years for U.S.-born blacks. Immigrant blacks ages 25 and older are also more likely than U.S.-born blacks to have a bachelor’s degree or more (26% versus 19%), less likely to live in poverty (20% versus 28%) and on average, have higher household incomes. They’re also much more likely to be married (48% among those ages 18 and older versus 28%) than U.S.-born blacks, which is likely tied to their higher median age. CORRECTION (Jan. 17, 2018): In the report text, the total number of black immigrants from the Dominican Republic was changed to 161,000 (it incorrectly said 166,000). This report explores the demographic, economic and geographic characteristics, as well as population trends, of the black foreign-born population in the United States. Black immigrants are defined as those current U.S. residents born outside the U.S. who indicate that their race is black or is mixed-race black, regardless of Hispanic origin. 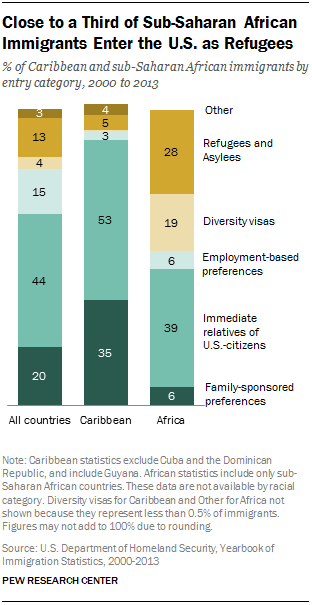 The report also compares the characteristics of black immigrants to U.S.-born blacks, foreign-born U.S. residents and the general U.S. population. Immigrant population estimates include all immigrants regardless of citizenship or legal status. The data for this report are from four main sources. The first is the U.S. Census Bureau’s 2013 American Community Survey, which provides the most recent detailed geographic, demographic and economic characteristics for foreign-born blacks, U.S.-born blacks, foreign-born U.S. residents and the general U.S. population. The other data sources are the 1980, 1990 and 2000 decennial censuses (5% IPUMS). The report was written by Monica Anderson, research analyst. Editorial guidance was provided by Mark Hugo Lopez, director of Hispanic research; Kim Parker, director of social trends research; D’Vera Cohn, senior writer; Claudia Deane, vice president of research; and Juliana Menasce Horowitz, associate director for research. Eileen Patten, research analyst; Ana Gonzalez-Barrera, research associate; and Anna Brown, research assistant, provided research assistance. Anna Brown number checked the report. Marcia Kramer was the copy editor. Related reports are online at www.pewresearch.org/hispanic and at www.pewresearch.org/socialtrends. The terms “black immigrants” and “foreign-born blacks” are used interchangeably throughout the report and refer to persons who were both born outside the United States, Puerto Rico or other U.S. territories and whose race is black or is mixed-race black, regardless of Hispanic origin, in 2000 and later U.S. Census Bureau surveys. For previous census years (1980 and 1990), “black immigrants” or “foreign-born blacks” refer to persons born outside the U.S., Puerto Rico or other U.S. territories whose race is black, regardless of Hispanic origin. Prior to 2000, respondents to Census Bureau surveys and its decennial census could make only one selection in the race question. In 2000 and later, respondents were able to indicate they were of more than once race. Immigrant population estimates include all immigrants regardless of citizenship or legal status. “U.S. born” refers to those who are U.S. citizens at birth, namely people born in the U.S., Puerto Rico or other U.S. territories and those born abroad to at least one parent who was a U.S. citizen.